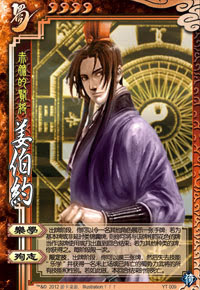 Once per turn, Jiang Bo Yue can force another character to show him one of their hand cards. If it is a non-delay tool or basic, Jiang Bo can use any of his hand cards of the same suit for the rest of his turn. Otherwise, Jiang Bo Yue keeps the shown card. During Jiang Bo's turn, he can choose to draw three cards and become any Shu character for the rest of his turn. If he does this, he dies at the end of his turn. Jiang Bo Yue must use "Last Resort" during his turn. He cannot use it when he is dying. Jiang Bo Yue cannot be saved at the end of his turn after using "Last Resort".